Day 01: Arriving in Kathmandu transfer to Hotel (B). Arrival in Kathmandu international airport (TIA), meet our staff who are showing our office board with your name then transfer to hotel half an hour drive, visit office, final payment and documentation, join staff meeting, overnight at hotel in Kathmandu. Day 02: Last preparation for trekking/City Tour (BB). Last preparation for trekking, pay tour rest of amount. Or City tour with city guide and tourist coach; Kathmandu is the colorful of Nepal, a fascinating blend of rational architecture and symbols of the twentieth century. It’s artistic and cultural heritages is evident where ornately carried balconies mingle with beautiful shrines and temples. If you have time, we recommend that you check out Durbar square, home to the palace of Kumari Devi, considered to be a living goddess. It is also worth the climb to visit Swaymbhunath the “Monkey temple”. Explore the network of street Markets and ally Bazars and witness the burning Ghats at Pashupatinatha. For those with a few extra days in Kathmandu, the neighboring towns of Patan and Bhaktapur are well worth a visit too. Overnight in Kathmandu. Day 03: Flight to Lukla (2840m) continues trek to Phakding (2640m) 3.30 hours, Overnight Lodge (B/L/D). Early morning, (35 minutes) flight from Kathmandu to Lukla (2840m). Meet our trekking crews’. After finish breakfast, to proceed from Lukla to Khumbu valley, head north, past a Chorten with praying wheels and join the main tail at Choplung (2696m) in less than one hour. The proceed from their head north crossing the Thado Khola (2554m) with the awesome trekking peak Kusum Khanguru (6483m) at its head. May you have lunch, today in Thalo Khola. After Thalo Khola continues walk throught Mane wall and beautiful stone print. After an and half hours to reach Phakding (2640m), or almost 3.30 hours from Lukla, overnight in Hotel. Day 04: Trek to Namche Bazar (3440m), 5.30 hours, Overnight Lodge (B/L/D). To cross the west bank (right) of the Dudh koshi river, Continue through blue pine and rhododendron forests, pass a settlement if Metal worker (Tok Tok), village of Banker (2905m) with small lodge, see view of Mt. Thamserko (6856m) 1 hr. In the short while cross to the east (left) bank and climb up through Chumowa, cross the Khansar Khola to reach Mondzo (2835m). Enter Sagarmatha national park here. Check your permit in Manzo, 1 hour from Banker. Descend in a cleft to the west (right) bank of Dudh Kosi on a suspension bridge to reach Jorsule (2774m) 30 minutes. This is last village before Namche. We take Lunch here & proceed to cross Dudh Kosi (Bhote Kosi) again to the left side & again to cross the main Dudh Kosi, climb up till to Namche Bazaar (3440m), proceed in pine forest. Can see, first view of Mt. Everest between Lhotse & Nuptse reach 2 and half hours from Jorsule. Overnight in Hotel. Day 05: Namche Bazaar - Acclimatization day, Overnight Lodge (B/L/D). 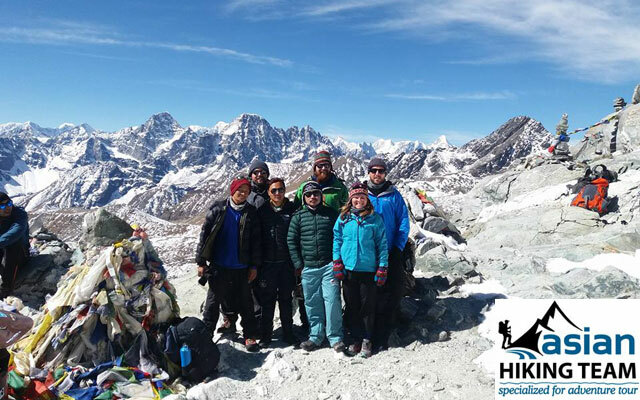 Today is rest day, however, we should do some activities such as to climb Syangboche airport, visit Sherpa home in khumjung/Khunde includes Adman Hillary school or view from Everest view point Hotel 2 hours. Namche bazaar has many officials or offices, including army base camp and bank. Namche used to be trading center, where grain from the south was exchanged for salt from Tibet and it’s remains now a trading center. Every Saturday is market day. There is headquarter of Sagarmatha National park (SNP) & Sagarmatha pollution controlled Project (SPCP), Sherpa Museum, Monastery. You can talk with your guide and decide what to do in Namche Bazar. Day 06: Trek to Tyangboche (3768m), 5 hours, Overnight Lodge (B/L/D). The tail rise to the settle to the east of Sagarmatha Nation Park Museum (3520m), instead, contour high above the Dudh Koshi River, passes Kyangsuma where few lodge and best view of Mt. Everest and Lhotse. Steeply down to reach Phorse Tanga, may we have lunch here today, this is last sport before Tyanboche. After hot lunch climb 2.20 hours to reach Tyngboche (3767m. After your arrival check hotel and visit monastery. Everyday 3PM and 6 am is worship time in Monastery, join the praying with monks for wish to success your treks. Overnight Guest house. Today, we start early around 7 to 8am. Half an hour down to Debuche, where is monastery and small settlements inside the alpine forest. After 45 minutes walk to cross suspension bridge, continues climb to reach lower Pangboche. 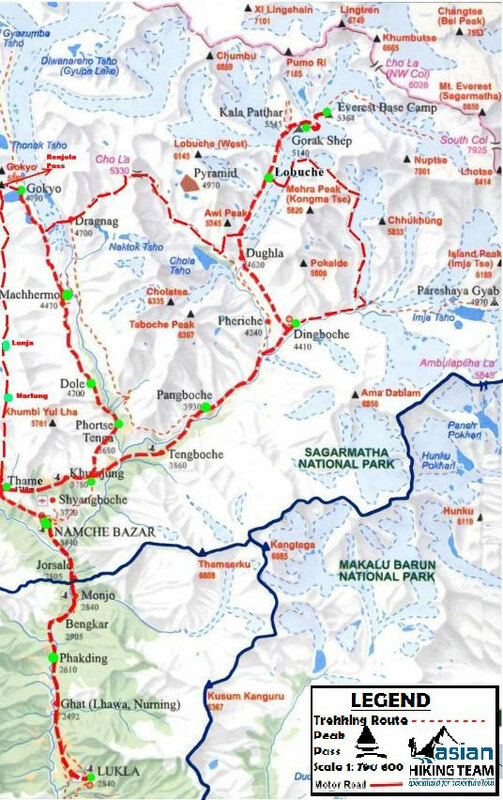 The trekking routes follow lower path of Pongboche. It is worth to visit Monastery if you have time, its takes 45 minutes extra to go Manastery in Pongboche Village. From lower Pongboche an and half hours walk to reach in small settlement call Somare, Have a lunch in Somare and gradually walk up. After 45 minutes walk from Somare catch two way, one heading to Pheriche and other is Dingboche. Right hand side direction is way to Dingboche 4410m. Cross the bridge, climbing up the landslide area an half hours then we can see the beutiful settlement is call Dingboche take 40 minutes from landslide area After arrival, have a short hot drinks with rest and climb 200 meters over the Nagarjun hill because of everyday we recommend “ascent high and sleep in low”. Overnight guest house. Day 08: Today is rest day/explore around and rest, Overnight Lodge (B/L/D). Today is rest day, we can visit the Monastery over the hill its takes 3-4 hours to see the view of Mt. Makalu which is above 8000m high Mountain. 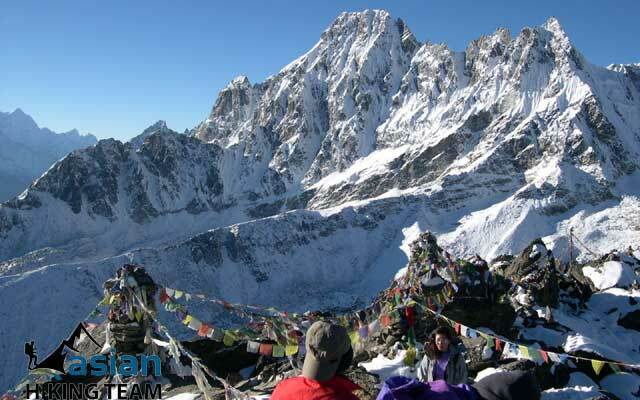 Or you can go the opposite side of Dingboche where can see the beautiful ice lake and view of Ama Dablam. Rest and relax, overnight in Hotel. 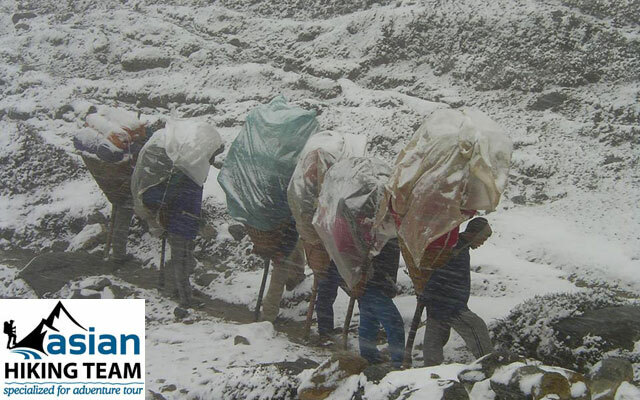 Day 09: Trek to Chhukum (4730m), 3.30 hours after lunch climb to Chhukum Ri 5550m (3/4 hours), Overnight Lodge (B/L/D). 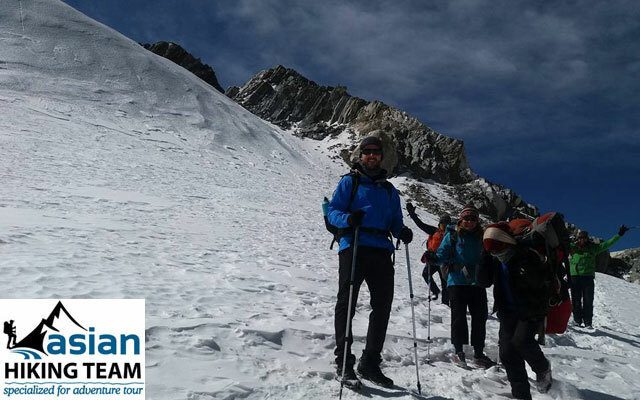 Today, the short trekking to reach Chhukum (4730m) 3.30 hours But you will recommend to our clients to climb Chhukum Ri which is 5550m high. It is like acclimatization and the virw on the summit. The trail follow the Imja Tse (Island Peak) gorge gradually climbing to Chhukum. Chhukum have few hotel and guest house for tourist. After lunch cross the tributaries and start steeply climb to Chhukum Ri 5550m (3/4 hrs) which is first highest climbing in three passes trekking, return to hotel 2 hours overnight at Lodge in Chhukum. Day 10: Kongmala pass (5535m) and trek to Lobuche (4900m) 9 hours, Overnight Lodge (B/L/D). Early morning start to climb Kongmala pass (5535m) and trek to Lobuche (4900m) 9 hours. We start at 4/5 am from hot breakfast, first an hour small trekking trail over the hillside. We catch the trail come from Dingboche over the 4800m. After that we gradually and steeply are climbing up to reach the flat area where you can see the Heli ground and the eye charting Lake. You are carrying many mountain if you turn back you can see the Island Peak, Makalu, Barutse, Ama Dablam etc. The last 15-20 minutes are very difficult climb to reach the summit of Kaongmala pass. Be careful when going up because if sleep you will be in blue Lake. After the pass the trail all the way steeply down to catch the Khumbu glacier. Cross the Khumbu glacier which is very carefully walking coz moving rock and if the weather bad or snow difficult to find the path, reach to Lobuche 4910m 3-4 hours from top. We have late lunch in Lobuje. Overnight at Lodge. Day 11: Trek to Gorep-shep 3 hours after Lunch continues trek to EBC (5370m), 2/3 hours and back to Gorep-shep (5170m), Overnight Lodge. Early in the morning leaving Lobuje, after lunch in Gorap-shep within 3 hours we will head up to Everest Base camp (5365 meters), and return to Gorak-shep at elevation of 5170 meters at noon for overnight stay. We walk over the moving stone with jump so it does hard, be careful to walk. Crossing the Italian high altitude research center, continues follow the bottom of hill. Climb half an hour and the trail over the glacier so up and down to Gorep-shep 5170m, check hotel, have a lunch and start walk to base camp. The trail to base camp is over the glacier, moving rock, if you are trekking in winter season is hard to find the path. Everest new base camp is 45 minutes before the old base camp. 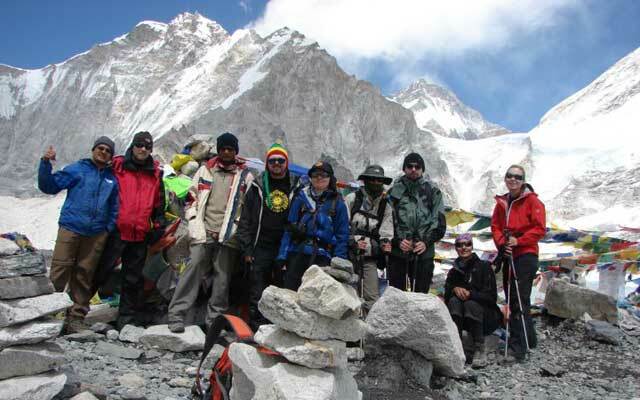 Old base Camp was over the Khumbu ice fall so all trekkers reach new base camp and return. It is also noticeable that from base camp you could not see the Everest view. Overnight in Gorep-shep at lodge/guest house. Day 12: Early morning climb to Kalapathar (5545m) 2/3 hours after breakfast trek to Dzongla (4830m), Overnight Lodge (B/L/D). After reaching Base camp of Everest our aim today is to trek Kalapattar (5545 meters). 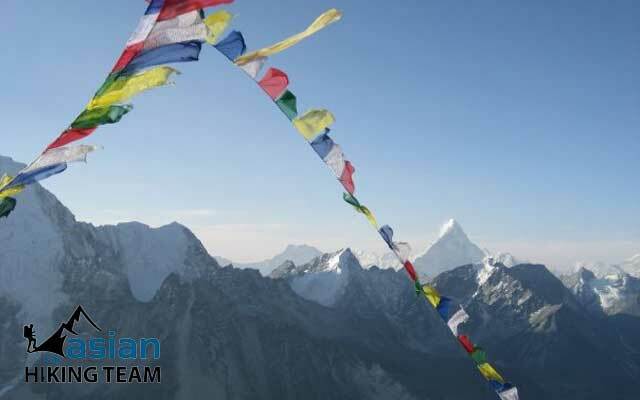 We start early morning before sunrise to reach the viewpoint that offers some of the best views of Mount Everest as well as other panoramas of the surrounding mountains. Kalapattar means “Black rock”, most excellent view point in the world. It takes 2 hours to reach top and returning to Gorep-shep take one hours or may less. Returning to Hotel, after late breakfast descend to Lobuje, have a lunch and 3 hours continues trekking to Dzungla (4830m), crossing bottom of Lobuje ranges, overnight in basic tea house/lodge. Day 13: Trek all way to Cho-la pass continues in Thangna (4700m), 8/9 hours (up and down), Overnight Lodge (B/L/D). Today is a long and challenging day of our trekking so that starting before sunrise at 4/5 AM to reach the pass by 9-10 AM otherwise weather conditions will greatly affect our journey. First an hour follows the peace and quiet valley then we start to climb gradually up. There are hug and hanging rock on the path, you need to carful when climb up, trekking poll will recommend. After finish to climb rock part then we reach snow valley. There are always running snows. We cross over at an altitude of 5300 meters we could be exposed to strong winds if crossing too late. However, the problem may arise due to the altitude and snow. It often causes terrible problems to cross the pass if it is covered by snow. Nearby the top have Ice Lake. It was start from few years before. So you need to cake when passing lake. The trail is right hand side on mountain side. As you reach the top, you are rewarded by the magnificent views, and then we descend to the Thangna at noon. We will bring some pack lunch. We will recommend to your clients to bring some chocolate, cookies and enough water. There is not any tea shop or hut between Thangna. After the pass an hour is very danger path steeply down. Sometime recommend to use ice-xe. It is also noticeable there are running stone so you need to care when going down. After 1-2 hours walking from top there are very nice route gradually up and down to reach Thangna (4610m). Overnight at Guesthouse/Tea house. Day 14: Trek to Gokyo (4790m) 3 hours, Overnight Lodge (B/L/D). Today, we plan short trek because we have long day in yesterday. After breakfast start walking over clasp Ngazumba Glacier. There are not prefer trail and the trail may change every years because of running glacier. Our guide leader you to follow the path and some place have sign of stone pyramid too. You are inside the valley of high mountain so both side have hug mountain includes Cho Oyu, Kangchung Peak, Cholatees, Tabuche, Kyanjo Ri etc. After crossing the glacier, you can see the Gokyo village near the Lake. The entire hotels are on the side of Lake. Opposite of you, Gokyo Ri. There are four Lakes in Gokyo valley (4790m). Check the hotel, overnight in hotel. Day 15: Gokyo Ri – Gokyo, overnight Lodge, Overnight Lodge (B/L/D). Today is like rest day. We will see the condition of all our group members and decide what and when to climb Gokyo Ri. To climb Gokyo Ri 5360 meters high take 3 hours to reach summit. From Summit you can see the includes Mt. Everest, Lhotse , Nuptse, Pumori, Ama Dablam very well. It is also interesting place to visit fourth lake take 4-6 hours walk. There is one of best view in Everest region. You can talk with your guide and decide what everyone like. Rest and relax safe energy for Renjola pass, overnight at hotel in Gokyo. Day 16: Climb to Renjola Pass (5340m) and down to Marulung (4210m) 8 hours, Overnight Lodge (B/L/D). Very early morning start to cross Renjola Pass. First part of trekking follows the lake over the west bank. After the gradually climbing and steeply climb to the summit of Renjola Pass. From the Gokyo take 4 -5 hours to reach top. The time is depending on group members’ situation. From summit of Renjola pass unbelievable Mountain View includes Makalu, Everest, Lhotse, and Cho Oyu which mountains are above 8000m high. Few minutes enjoying the view and take picture. After pass we are going another valley, steeply down. Renjola pass is very nice trail, there are Yak or horse also cross in spring time. The entire paths are steps. After 1.45 minutes down then comes the flat land. Very beautiful valley, continues follow the flat down land 2 hours and reach to Lumde (4368), we have lunch in Lumde and walk 1 hour to reach bottom of Bhote Koshi river, cross the suspension bridge, check the lodge in Marlung (4210m), Overnight in Lodge. Day 17: Trek to Thame (3820m) 4 hours, Overnight Lodge (B/L/D). Today also very short day 3 hours walking, all the itinerary when we pass high passes next day make short day because of you are so tried and see the members situation so the itinerary mention short day. Well, today gradually going down and passing many memorable status and Mane wall to reach Thame valley. Thame is famous place for burn world record Sherpa. The monastery, potato farm, Sherpa live style are very attract for tourist. Explore the village and cave monastery, overnight in Thame at hotel. Day 18: Trek to Namache Bazar (3440m) 3 hours, Overnight Lodge (B/L/D). Trek to Namache Bazar (3440m) 3 hours, follow the beautiful trekking trail. From Thame cross the Bhote koshi River and walk the rhododendron forest crossing many tributary and hydro project. There are so many Buddha Gomba on the way. You are always round in clock side. As well as the Mane wheel also round on clock side. Reach to Namche Bazar, relax and rest in hotel, shopping or visit the German Bakery etc. overnight in Namche at Hotel. Day 19: Trek all the way back to Lukla (2840m) 6/7 hours (same way), Overnight Lodge (B/L/D). Trek all the way back to Lukla (2840m) 6/7 hours (same way) as trek first and second days. We have lunch in Phakding. After reach Lukla, last minutes explore the village and celebrate the last night in mountain, overnight in Lukla at hotel. Day 20: Lukla to Kathmandu by flight, transfer to Hotel, (B/L/D). Early morning breakfast and go to Lukla airport before one hour of your flight time. The time may change and the flight depend on weather so your guide determine the time. 35 minutes flight from Lukla, transfer to hotel in Kathmandu, rext and relax. In the evening join fare well dinner with Nepali culture programs. Overnight in Kathmandu at hotel. Day 21: Departure for next trip or own way journey (B). Camera & accessories Penciled, note books, reading books, passport, Cash, credit card etc.